Bluetooth is a proprietary open wireless protocol for exchanging data over short distances (using short length radio waves) from fixed and mobile devices, creating personal area networks (PANs). It can connect several devices, overcoming problems of synchronization. To make using a cell phone less distracting during driving, Headsets were developed. Cell phones were found to be stronger in cars. In certain cases electromagnetic interference causes an irritating noise on the radio. In other cases it could be harmful to life, such as the effects a signal from a mobile phone could have on the electronic safety systems in a car. It then becomes increas ingly important to make computations of electro magnetic fields. Such computations are Jan Carlsson’s specialist field and they can be used in several applications at SP, the Swedish Testing and Research Institute in Borås, where he is employed. Electro­magnetic Compatibility, EMC, is the ability of a product to function without interference and is one of his principal areas of interest. 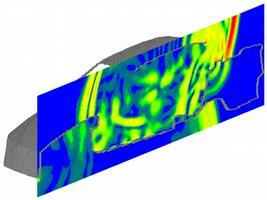 With the aid of software, the electromagnetic fields formed by electric cables and other components can be simulated. Modern cars also have an increasing number of antennas, such as GPS, mobile phones, bluetooth and crash radar. It is a matter of finding the best locations for these and ensuring that everything works optimally together, i.e. that they are compatible. Jan Carlsson has already worked a great deal with Chalmers. He was employed at SP and did his thesis in emc as an industrial doctoral student at Chalmers in 1998. This was the first thesis on this subject. It is of course possible to protect the equipment in different ways, such as using metal covers and screens. But in cars we are chasing grams in weight reduction and it would be inconceivable to cover all the cables in metal. The design and positioning of electrical and electronic units is therefore crucial. Now that safety systems in society are controlled to such a large extent by electronics, EMC is very much at the forefront. With the EU issuing peremptory directives in 1996, whereby all apparatuses should be EMC-approved, many believed that the need for testing would increase dramatically. Although several test labs were set up the upturn was not as great as expected and certain laboratories were forced to make cutbacks. SP, however, is going against the flow and expanding in order to, among other things, offer customers calibration of test antennas for EMC, an area where there is considerable interest. There is also collaboration with Ericsson in Mölndal on their new measurement range, where the aim is to offer other customers accredited antenna measurements with a high degree of accuracy. A model of a car including the driver and three passengers with the driver speaking on a mobile phone. 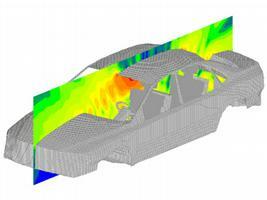 The picture shows the electric field in a cross section through the car at the frequency 875 MHz. Recently, Jan Carlsson has co-operated a great deal with the antenna group at Chalmers and studied so-called patch antennas, which are found at base stations. They have also tested antennas on mobile telephones. Personally, Jan Carlsson is not particularly afraid of the radiation emitted by mobile tele phones. A model of a car subjected to an electro magnetic field. The vertical polarised plane wave is incident to the front of the car and the picture shows the electric field in a cross section at a time instant where the wave front has just passed the rear window. Would you please foward me with your information source about the 36X more exposure in cars…onebodymind.net is not accessable to confirm that data. Also, do you have an estimate for children?